Point and Figure charting methods are different from any other type of chart used in stock chart analysis. The main reason being that they do not have a time scale. The chart does not advance as time passes but rather as intermediate trends change. Their foundations were laid in the late 19th and early 20th century where traders needed an easy way of recording price movements. Initially they did this by writing down the prices traded throughout the day in columns; a rising column of numbers to denote rising prices and a falling column of numbers to denote falling prices. After awhile they began to notice patterns in their price records and so what started off as a price recording system became a stock analysis charting method known as a Figure chart. As writing down prices became tedious, the numbers were replaced by Xs and the chart came to be known as a ‘Point chart’. Figure charts and Point charts continued to be used together and chartists referred to their ‘Point’ charts and their ‘Figure’ charts, or their ‘Point and Figure’ charts, the name we use today. Figure charts eventually ceased to be used in the 1930s and in the late 1940s a new plotting method was developed using Xs for the rising columns and O’s for falling columns. Kennys Elliott Wave Analysis is my trading plan for the week ahead with regular updates. Technical analysis charts and report using Elliott waves, chart patterns, trend trading strategies, Hurst cycles and other stock market time cycles analysis. Figure 1 shows the development of the P&F charting methods. As you can see, Point and Figure charts assign a value to each square on the chart, which P&F chartists call ‘boxes’. 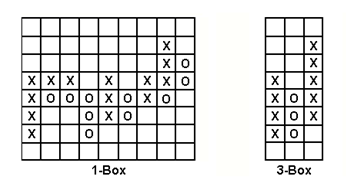 In the example above, each square or box is worth 1 point. As the price rises or falls by 1 point or more, new squares are filled. Any price change less than 1 point is therefore ignored. The value assigned to the box, called the ‘box size’, depends on the price of the instrument and how sensitive you want the stock chart to be. For example, you may use a box size of 100 for the Dow, but a box size of .01 for the Euro. Reducing the box size, increases the sensitivity of the chart analysis and therefore reduces the time horizon. As you can see from the Figure chart above, when the price changes direction you have to move to the next column to write down the numbers in the opposite direction. If, however, the price reverses by only one box, sometimes a change of column is not required because there may be space to write the number in the current column. This became known as a 1-box reversal chart and is the original plotting method. 1-Box reversal charts can therefore have an X and O in the same column. As 1-box reversal charts were quite sensitive, a more condensed version, called a 3-box reversal chart, was also used. With these charting methods, the price must reverse by at least the value of three boxes before changing columns and can therefore never have an X and O in the same column. 3-Box reversal is now the most popular Point and Figure method used today. Figure 2 shows a 1-box and 3-box construction using the same data set. Notice the X and O in the same column in the 1-box chart. Notice too how much more sensitive the 1-box chart is. It is customary, when drawing Point and Figure charts, to name them according the box size and the reversal. So a chart drawn using the 3-box reversal method where the box size is 5, is called a 5 x 3 Point and Figure chart; one where the box size is 20 using the 1-box method is called a 20 x 1. Remember that Point and Figure charts came from the trading floors and bucket shops where every trade was recorded. This was not a problem for anyone updating a small set of charts by hand each day, but impossible for anyone who wanted to create a new long history stock chart. So some users started using end-of-day prices to draw their Point and Figure charts. Two charting methods were used, either the closing price at the end of the day or, the high or low, at the end of the day. The end-of-day high and low cannot be used because it is impossible, without reference to the intraday ticks, to know which came first during the day. So a set of rules was devised to determine whether end-of-day high or end-of-day low are used each day. Let John Murphy guide you through his thought process in selecting markets to trade, in this Free 90 min video. This classic video is still one of the most insightful you are ever going to see on investing and trading. Watch John Murphys "Applying Technical Methods to Today's Trading" for Free. Free to download, the Traders Day Trading free Elliott Wave Theory PDF quick start guide. Download it free now for a quick overview of the basics. It is a handy reference guide to the basics of the wave patterns and wave formation.